One of the challenges for parents who live apart is finding a way to talk with their ex-partner about parenting issues. Initially it can seem like every conversation is a difficult one! You and your children's other parent might be finding it difficult to make arrangements for your children and you might be arguing a lot. This information will give you some ideas about how to communicate positively with your children's other parent. Finding ways to communicate constructively with your ex-partner can really help your children adjust to the separation. Why is it important to think about communication and conflict? Every family has arguments and has to learn how to manage disagreements; it is part of family life. Research tells us that whether parents live together or apart, conflict can have a negative impact on their children if conflicts are frequent, unresolved, intense or physical. It can be particularly difficult for children if they think that they are the cause of the arguments or they feel 'caught in the middle'. Finding ways to communicate constructively with your ex-partner can really help your children adjust to the separation. Conflict between parents can be about different things. After a separation there can be many feelings about the end of the relationship - sadness, anger, frustration, relief, guilt – and lots more! It can be helpful to try to separate your feelings about the end of the relationship from how you feel towards your ex-partner as a parent. You and your ex-partner don't have to like each other – you just need to find a way of working together for your children. It can be helpful to arrange a mutually suitable time to have a conversation, whether on the phone or in person. Avoid having difficult conversations with your ex-partner in front of your children, or if you are concerned that you or your ex-partner will be angry or even if you are just tired, hungry or upset! Arrange a time and a place that suits you both to have the conversation. Some parents find it helpful to make appointments to meet each other regularly to discuss parenting issues. Be clear about what you want to say but also be ready to listen to the other parent's views. If you are worried that the conversation will become an argument, try meeting in a café as it can be easier to keep calm in a public place. It might seem easier to use email or text to make arrangements to avoid talking directly or seeing your ex-partner face to face. These can be useful in some circumstances, but it is important to remember that texts or email can easily be misinterpreted and lead to misunderstandings. Try to really listen to what your ex-partner has to say. Try not to interrupt or plan what you are going to say next while they are still talking. Try not to react immediately to something that has happened or has been said – take a moment. It is OK to ask for some time to think about a suggestion or respond to a comment. You might want to agree in advance how you are going to let the other person know that you want to 'pause' or 'hold' conversations that are getting out of hand, perhaps with a particular phrase or signal. Be clear about what you want to say but also be ready to listen to the other parent's views. Identify how you would like things to be in the future for your children and focus on working together to achieve that. Remember there may be a number of different solutions to the problem you are discussing. Try not to be fixed upon your own ideas, be creative and be prepared to compromise. Focus on the parenting issues that need to be resolved and try to stick to one thing at a time. It can be easy to get distracted onto other issues that are not related to parenting, particularly if there are unresolved feelings about the separation. Some parents find it helpful to write down what they want to discuss. Try to start with something positive, perhaps something that you know you agree about or something positive about the children. You can't control your ex-partner's behaviour and you aren't responsible for changing their behaviour. The only person you can change is yourself. This can be challenging if your ex-partner chooses to be hostile towards you or to criticise you in front of your children. Try to remain businesslike and think about what you can do or say to try to have a helpful conversation with your ex-partner. It can be particularly difficult for children if they feel 'caught in the middle'. People experience things differently and it may not be useful to get into an argument about what really happened. It can be helpful to state clearly how an action makes you feel and what would help. When... (what the action was – without blaming or criticising). Try to think about how things are from the other parent's perspective and to understand their view. How would you feel if you were them? What would you want to happen if you were in their shoes? Think about your children's views too. Imagine your ex-partner as a work colleague and speak respectfully, even if this isn't how you feel. Avoid judgemental statements, personal attacks and name calling. "Try to think about how things are from the other parent's perspective and to understand their view." Try to avoid using 'always' or 'never' when you are describing the situation. It is rarely the case that someone 'never ' does something, or is 'always' late, for example. These words tend to lead to the other person becoming defensive - they will try to think of a time when they WERE on time or they DID do what had been expected. 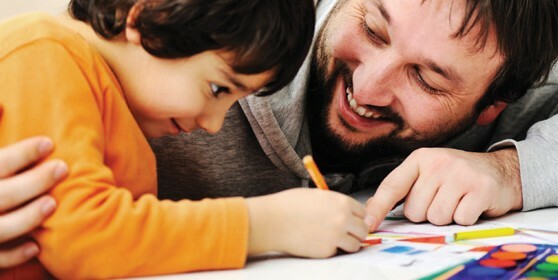 Parents who live together often share information about their children's school, health and activities without really knowing they are doing this. When parents live apart it can be harder to keep up-to-date with things that are important to their children – this can sometimes lead to misunderstandings or arguments. Try to communicate directly with your ex-partner as children can find it difficult to act as a messenger or go-between. Work out what your children need you both to know and agree a practical way of keeping each other up-to-date. This might feel a bit awkward but your children will appreciate you both trying to remember the things that are important to them. If you think that the conversation might be deteriorating into an argument – stop. Recognise the issues that you have managed to agree on and acknowledge that the conversation is becoming unhelpful – without blaming or criticising the other parent. Suggest that you both speak again at another time. If you think that the conversation might be deteriorating into an argument - stop.